Participants receive a t-shirt, finsher's medal and get to enjoy the post race party. In addition to above, the series (all three events) participants receive a finsher's glass at the completion of the Trex Tri in August! BACK FOR 2019! 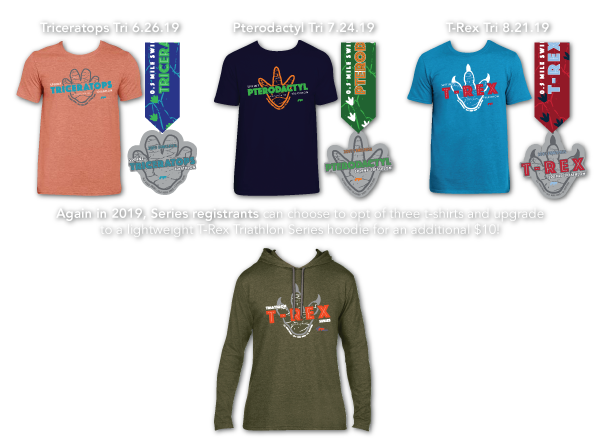 Series registrants will have the option to opt out of 3 t-shirts and upgrade to a light wieght tri-blend hoodie for $10 additional dollars! Sorry, no refunds and or entry fee transfer to another RF Events' event.